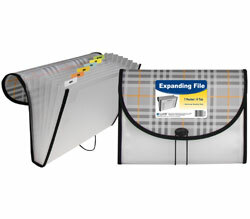 13-Pocket expanding file keeps documents organized while providing easy access. Zipper closure keeps materials safe and secure. 13 pockets expand to hold important letters and documents. Includes tabbed dividers with customizable, color coded inserts. Holds up to 300, 8 1/2 x 11 documents. Blue. 1/EA.